Yesterday was phase one of the Digital Switchover here in Sussex, or at least the bit of Sussex in which I live. All TV signals in the United Kingdom will soon be digital only because we live in the future and are cutting edge and think nothing of bewildered old dears wondering where Coronation Street has gone. This whole thing has sort of passed me by to be honest. I've had digital television for years so I've largely put it to the back of my mind as an irrelevance. Oh what a fool I was. Come the time I did what every obedient digital television consumer had to do and re-scan their box or television, the horrific reality of the matter was revealed. People served by the Whitehawk Hill transmitter are now considered to be in the BBC South East region rather than in BBC South. Woe is me. I used to complain bitterly about BBC South. I felt that, due to the unique way the BBC is funded, every time they ran out of money because Jonathan Ross said something to an elderly man or suchlike, BBC South bore the brunt. BBC South sprawled out to eventually encompass places as demonstrably not south as Oxford and Swindon. It was exquisite madness. But it was OUR exquisite madness, you know? BBC South East smells. It covers East Sussex, a little bit of West Sussex, Kent, Surrey and Essex. To be honest, I live much closer to Surrey and Kent and Essex than I do to Oxford or Rhyl or Dublin. BBC South East will probably prove to be more relevant local news to me, if I'm completely honest. But I don't like it. BBC South Today used to provide you with a delightful numbing cushion of distance. "A MURDERER HAS ESCAPED," the bulletin would roar. "HE IS ANGRY AND FRANKLY WANTS TO KILL YOU warn Oxfordshire police". Phew! Oxfordshire! It just doesn't feel right. I was used to the local news that was happening miles away which I didn't care about being in Winchester or Banbury. Now I have to adapt to it being in Rochester or Canvey Island. To give BBC South East their due, yesterday's brave new world bulletin did throw Brighton a bone by featuring them as their second story. But it was about how far above the national average we are for teenage pregnancy rates. Tomorrow: do men in Uckfield have smellier balls than chimps? It was a bone, but it was a pretty manky bone with a maggot on it. And a pube. But as well has having to recalibrate my moping rants about "local" news covering things which are actually halfway to Saturn in a south-easterly direction (I'm sure I'll cope), there is the more troubling issue. No more Sally Taylor. 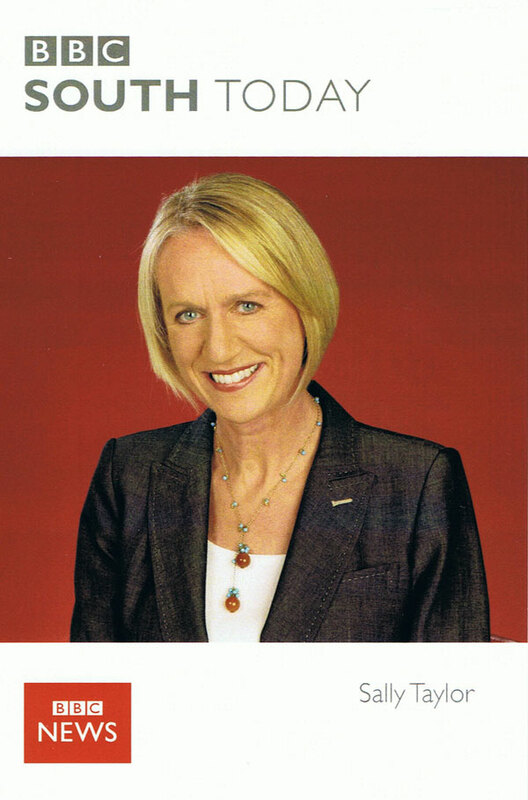 Sally Taylor is local news royalty to people from the south coast of England. She is the reassuring presence who has been with me pretty much my whole life, telling me about a beer festival on the Isle of Wight or a particularly rude-looking tree in Bournemouth. Sally Taylor has been reading the local news for the south for so long that she actually appears in the Bayeux Tapestry, reporting on William of Normandy's landing at Pevensey. Brighton has expanded in recent years. All sorts of new people have arrived, attracted by its proximity to London, it's trendy image and the fact that it is the best place on earth. Moreso even than accents or "I *heart* Cambridge" sweatshirts, asking people their opinion of Sally Taylor was the most surefire way of gauging where in Britain people have come from and when. If they said anything critical in the slightest - "I don't like her shirt", or something - we would know that they were a newcomer. Proper southern people hold Sally Taylor in the highest regard. For Brighton folk, she would be one chair at our dream dinner party. At mine she's sat next to Hitler. But alas. My bitter rivals in Portsmouth will still get their daily local news from Sally Taylor on South Today, the programme she first presented when the dinosaurs ruled the earth. People in and around Brighton will have to make do with Hugh Opinions or Muriel Spank or whoever the hell it is. I feel deeply disenfranchised. It's almost enough to make me want to move to Southbourne (as close to Hampshire as I am willing to get) just so I can get back to shouting at Sally about how Abingdon isn't in the bloody south. Oh Sally.